TORONTO, ON – Left Field Brewery has announced the release of its interpretation of an increasingly popular beer style. We dry hopped this beer with glorious amounts of Hallertau Mittelfruh and Styrian Bobek hops. These German and Slovenian noble hop varietals were selected for two key reasons: First, they are traditionally grown in the regions bordering Italy’s northeast, and second, their piney, mildly spicy and floral characteristics make them a perfect companion to the specific base malt that serves as a key inspiration for this Italian Pilsner – Weyermann® Eraclea Pilsner Malt. This 2-row winter barley is grown near the Adriatic Sea northeast of Venice and lends a delicate aroma with a noticeably sweet finish. While originally developed in Bavaria, this Eraclea barley prefers arid conditions and truly flourishes in the terroir of Italy’s Adriatic coast with long sunny days and dry climate. 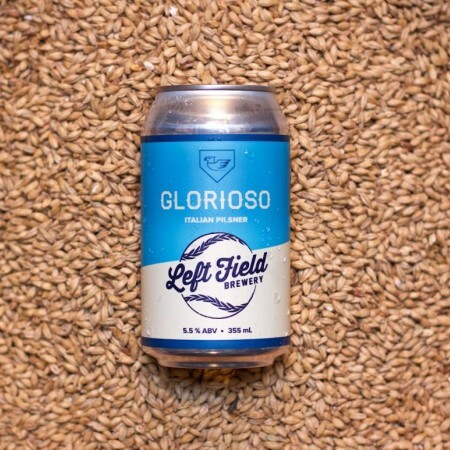 Glorioso Italian Pilsner is available now on tap and in 355 ml cans the Left Field taproom, with cans also available via the brewery’s online store while supplies last.